In a letter to the chairwoman, Sanders noted that of the 45 names he submitted to Democratic National Convention committees, Wasserman Schultz appointed only three. Sanders said that if the disagreement over convention committee appointments is not resolved, he would have his delegates move to change the platform on the floor of the convention. As I discussed recently, the system is heavily rigged to prevent insurgent candidates such as Sanders from winning the Democratic nomination. The Democratic primary system turned out to be even more rigged and less Democratic than the Republican. Despite the likelihood of Sanders beating Clinton in the upcoming primaries, the system has guaranteed that Clinton will go into the convention with a majority of delegates. 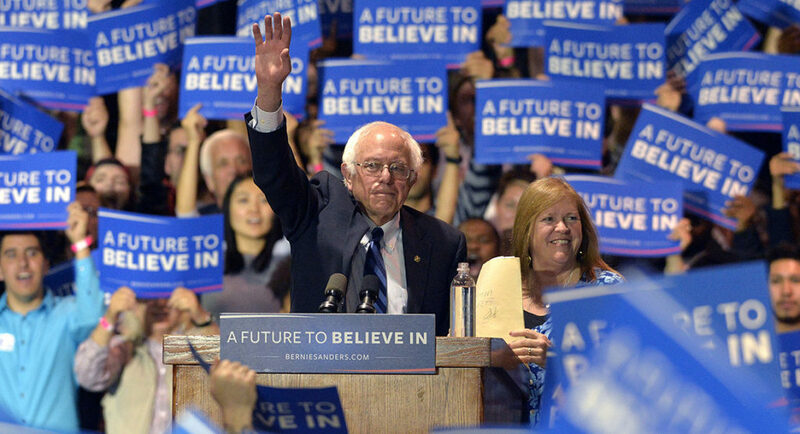 Sanders’ only remaining hope is if superdelegates defect from Clinton to him. It is unlikely that the superdelegates will support an outsider over the establishment candidate. This could only happen if the situation changes considerably between now and the convention. There is the long shot possibility that superdelegates could change their mind if they saw how much weaker a candidate Clinton would make against Trump than Sanders, but I fear that many establishment Democrats would rather lose with Clinton than allow Sanders to take control of the party. As I discussed yesterday and Gawker discussed today, Clinton is capable of blowing it against Trump, despite her considerable lead at the present. She has demonstrated both in 2008 and this year that she is a terrible candidate and makes many mistakes with messaging. While she currently has a strong lead over Trump, she would be facing a very tough race against virtually any other Republican, and it is not impossible that Trump could overcome his deficit in a race against a candidate who is as unpopular and flawed as Clinton. Posted in Bernie Sanders, Donald Trump, Hillary Clinton, Politics. Tags: Bernie Sanders, Democrats, Donald Trump, Hillary Clinton, Politics. RSS feed for comments on this post.. TrackBack URL. Well, those establishment Democrats may just lose with Clinton. And if they aren't up for election this year, they most likely will be two years from now and people will still be pissed. I've already checked the lists and any Democrat who is a pledged to Clinton superdelegate, especially in states that voted for Bernie, don't get another dime from me. And I tell them so, whenever they solicit me. I'm very disappointed in those I supported in the past. And even though, they probably won't miss my little donations, the hope is that there are a lot of people like me. hillary will not win we #BernieorBust refuse to vote for her. Some will write #Bernies name in others will vote for Jill Stein the green party some will stay home. I and many others will vote for trump the lesser of two evils. We are sick of the blatant corruption in our government (Bribes) in the hundred of thousand of dollars, our politicians are that brilliant and inspirational.I have been a registered democrat for 40+years the democratic party will not survive with out us. It is time for the party to unite around #Bernie or die there are people leaving the party at an alarming rate and there will be many more after the convention. Everything you Sanders loonies write makes me more glad he won't be the nominee. If Trump is a fascist at heart you guys are disappointed Bolshies in sheep's clothes. « Sure Clinton Is The Lesser Of Two Evils, But Does She Have A Winning Message?